Sirte (Agenzia Fides) - The government authorities of the Libyan national agreement have announced the discovery of a mass grave containing the remains of 34 Ethiopian Christians killed in 2015 by jihadists affiliated to the Islamic State (Daesh). The mass grave, reported in recent days by the Department of Criminal Investigation of the Libyan interior ministry, has been identified in a land not far from the coastal town of Sirte, in an area that in 2015 was under the control of the jihadist armed groups. The Libyan authorities - according to official national sources - have said that the mortal remains of Christians slaughtered by Daesh will be repatriated to Ethiopia, once the due national and international legal procedures have been carried out. In April 2015, a video released by Furqan Media - accredited at that time as the media reference network of the Islamic State - had shown two different groups of prisoners presented as Ethiopian Christians who were beheaded and gunshot to the neck in a desert and on a Libyan beach. The video, accompanied by the usual slogans against the "nation of the cross" included images of the destruction of churches, icons and Christian tombs, addressed to Christians, and repeated that there would be no salvation for them if they did not convert to Islam or did not agree to pay the "protection fee". In the video - particularly eloquent - the victims were presented as belonging to the "hostile Ethiopian Church". The massacred Christians were poor Ethiopian immigrants belonging to the multitudes of men and women trying to reach Europe through Libya and then embark on the boats managed by the criminal network of smugglers. The Ethiopian Orthodox Church was jurisdictionally bound to the Coptic Patriarchate of Alexandria until 1959, when it was recognized as autocephalous Church from the Coptic Patriarch Cyril VI. Even in recent years the Coptic Church has been the target of the massacres and attacks by the jihadists of Daesh, also because they identify it as an ecclesial entity close to the political institutions of Egypt led by President Abdel Fattah al Sisi. 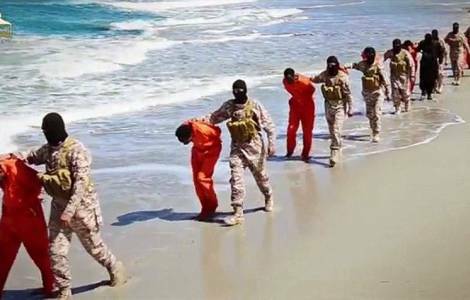 Between January and February 2015, just a few months before the massacre of Ethiopian Christians, even 20 Coptic Egyptians and one of their Ghanaian work mates had been slaughtered by jihadists on a Libyan beach not far from Sirte. "What was striking", declared Anba Antonios Aziz Mina, Coptic Catholic Bishop - now emeritus - of Guizeh "is that the Ethiopian Church is called 'hostile Church' ... obviously these strange jihadists also follow the political implications of the meetings between the Churches. "But in the great pain", said the Coptic Catholic Bishop on that occasion to Agenzia Fides(see Fides 20/4/2015) "we continue to look at these events with the eyes of faith. The chain of martyrs has not finished, and will accompany the whole history until the end. Christians do not seek martyrdom, they want to live in peace and joy. But if martyrdom comes, it is comforting to see that it can be accepted with the same peace which was accepted by the Copts who pronounced the name of Christ and they relied on Him as they were being slaughtered. The Church has never complained of martyrdom, but has always celebrated martyrs as those in whom, while they are being killed, the great and consoling victory of Christ shines".